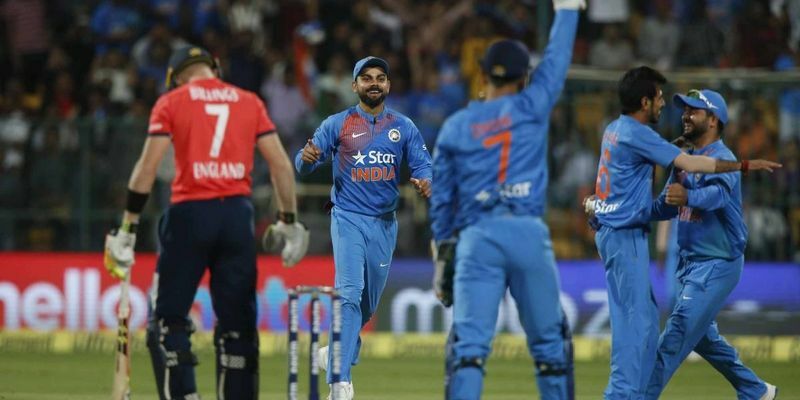 India secured the T20 series win over England, after earlier winning the Test and the ODI series, by 75 runs thanks to exceptional performances by the spinners. Yuzvendra Chahal (6/25) and Amit Mishra (1/23) were the stars of the show as they destroyed the English middle order in the final T20. Like the previous two games of the T20 series, England Captain Eoin Morgan won the toss and opted to field first despite having lost the last match while chasing. Both teams made one change from the Nagpur game with the home side handing a debut to youngster Rishabh Pant while England recalled Liam Plunkett for Liam Dawson. After falling in his twenties in the last two matches, Virat Kohli's struggles with the bat continued as he was sent packing in the second over for a shock score of just 2 - India had scored just eight runs at the end of the over. However, Suresh Raina and KL Rahul upped the run rate with easy boundaries and took India's score to 64 after seven overs. Rahul was then adjudged to be out when a Ben Stokes ball displaced the stumps, but replays suggested that the Karnataka player was unfortunate as the Englishman had overstepped his crease by quite a bit. India made a tactical change of sending in MS Dhoni ahead of Yuvraj Singh in the match, and it proved to be a masterstroke as the ex-CSK duo scored a 37-ball 55 partnership, with Raina going past his fifty for the first time since June 2010. Raina, who was scoring at a strike rate of over 140, mistimed a shot to mid-off to end a brilliant 63 off 45 balls. Dhoni then picked up the run-scoring mantle from Raina ensuring that the home side got at least a boundary-an-over. Dhoni reached a milestone of his own when a single off Chris Jordan, in the 18th over, earned him his first T20I half-century in his 66th T20 match. After that, it was the Yuvraj show, who scored 23 off the next five balls. Even though Yuvraj and Dhoni departed over the next two overs, India managed to set England a target of 203. Ashish Nehra got India off to a good start as he conceded just one run in the first over, and in the very next oneYuzvendra Chahal got the home side their first breakthrough when Raina's brilliant catch sent Sam Billings back. It could have been better for India when some miscommunication saw both Jason Roy and Joe Root stranded at the striker's end. Instead of just taking the bails off at the non-striker's end, Chahal suffered a moment of madness and threw the ball to Dhoni, who was incensed by the spinner's decision-making. England, however, recovered quickly and started scoring at a rate of over 10 runs an over to go past 50 in the power-play overs. With the partnership approaching 50, India brought Amit Mishra into the attack, and it was the 34-year-old who got them the breakthrough that they desperately needed - Roy tried to slog-sweep a spinning delivery but ended up skying it straight into Dhoni's hands. Half-way through, England had managed to accumulate 86 runs for the loss of 2 wickets. The Indian captain took the risk of opting to hand the ball to a part-time spinner, Suresh Raina, but it proved to be a disastrous decision as the left-armer was smashed for 22 runs thanks to three sixes by Morgan. Mishra, on the other hand, finished his excellent spell conceding just 23 runs in his four overs. Chahal proved to be the main star of the show as he not only broke the 64-run partnership by dismissing Morgan but dismissed Root on the very next ball as well taking the required run-rate past 14. After the Root wicket, Chahal just went through the English middle order like a knife through butter as he finished with figures of 6/25 as England lost eight wickets for just eight runs. Bumrah then put England out of their misery as the tourists finished their tour with a score of 127.